Cozy new apartment (bright and fresh, 50m2) for 2-4 people in the center of El Campello, located in a great, calm and clean neighborhood, next to the park, only few steps from beautiful and sandy beach (5-minute walk). Perfect for couples, families and short trippers. Fully equipped and furnished. Featuring air-conditioning, air-ventilation and free Wi-Fi. First floor, 2 lifts, silent and respectful zone. Safe housing estate - a key gate. The open living room combined with the kitchen and dining room is equipped with sofa bed (full-sized, 140x200) and brand new flatscreen TV (55'). The bedroom consists of big double bed (160x200) and big wardrobe. It has fitted blackout blinds. Suitable for 4 people kitchen has dishwasher, oven, electric hob, washing machine, toaster, cafeteria and dining table. In the bathroom you can find shower/ wc as well as hair dryer and iron/board. The most wonderful place in the apartment is a large terrace/balcony (12m2) overlooking the park and palm trees with additional dining table for 4 people and chair for sunbathing. The perfect place to catch up over a cup of coffee. Take a walk along the 2 km promenade of El Campello – the heart of Costa Blanca, where there are numerous of restaurants, bars, shops and lovely yacht harbor at the end of promenade. •	pedestrian zone next to the beach with all sorts of shops, restaurants and bars. Smoking, pets, events are not allowed. Spain is our favorite place to spend free time: everyday sun, very nice and friendly people, delicious food and aromatic coffee on every corner. El Campello with crystal clear waters and excellent year-round weather make for an ideal place for water sports such as sailing, scuba diving and windsurfing. 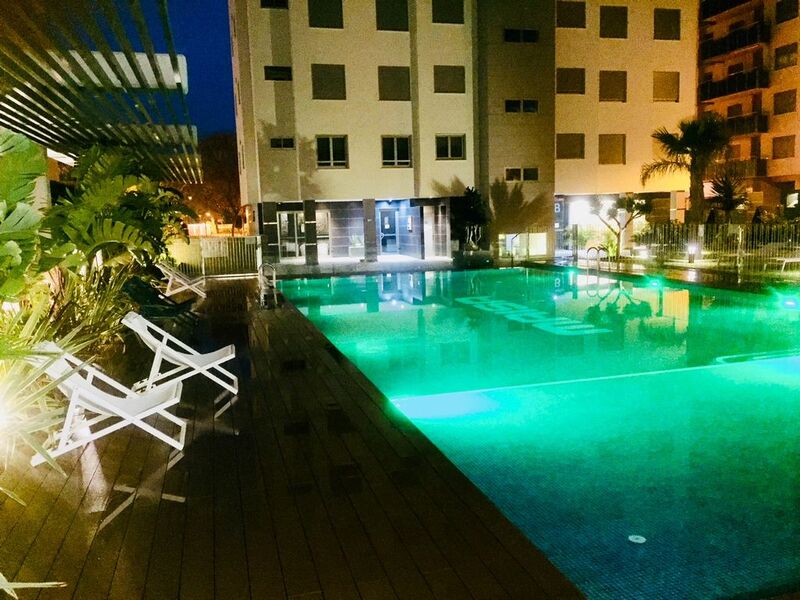 Our brand new apartment in the center of El Campello, bright and fresh, fully equipped and furnished, with big terrace and magnificent view of the Municipal Park (palm trees) is only few steps from beautiful and sandy beach. Very good, comfortable location! No car is needed because beaches, supermarkets, shops, bars, restaurants are within a walking distance. Total relax! Bathroom with: a shower and WC, iron/board, hair dryer, soap, towels. Cold/warm air conditioning units and ceiling fans with regulation control in the whole apartment. There is secure garage within the comples, in the underground with direct access (on request). It is possible to leave the car in the parking lot in front of the building in public parking place. There is secure garage within the comples, in the underground with direct access (on request). Bath towels and hand towels are provided, but not beach towels - please bring with you. There are 2 lifts, very comfortable and clean. Living room with: sofa beds (full-sized) for 2 people, shelfs and brend big new flatscreen TV. Equipment for 4 people. Everything you may need. Oven, fridge, toaster, hob, coffee maker, kettle, dishwasher and everything you may need: pans and griddle, fully stocked drawers/cupboards with crockery, cutlery, glasses, kitchen utensils. Table for 4 people. Fully stocked drawers/cupboards. Flatscreen TV (new 2017) which has mainly Spanish programmes and some channels in English language. Garden around the pool, with palm trees and flower. With sunbeds. Social club for meetings. There is a large paved patio with little foutain. Big (12m2), sunny, with a view on the Municipal Park with palm trees, with the exit of two rooms. Dining table for 4 people. Sunbeds. Laundry dryer. The rental is clouse to the beach (300 metres): kayak, surfing boards etc. The rental is clouse to the beach (300 metres). There is marina and sailing club (300 metres). It is possible to rent a boat or or participate in an organized sea trip. Community large paved patio/deck area with swimming pool and social club. Public tennis court 200 metres away. There are 4 golf courses within a 30 minutes drive: Alicante Golf Club (clouse to San Juan), Bonalba Golf Resort (7 km), Alenda Golf Club (outside of Alicante), Real de Faula Golf Club. Pool with beach chairs. A separate part of the pool with a small playground for children. Chill out zone and social club. The pool is not heated, it may not be warm enough until May. Public indoor swimming pool only few steps from the apartment. * Bedlinens and towels are included. * Costs (electricity, water, wi-fi, air-conditioning, air-ventilation etc.) included. Very good location near the beach, shops, cafe. Swimming pool on the premisses. Beautiful apartment and pool area. The apartment is in great condition with comfy bed and a decent shower. The small kitchen area has all you need too prepare a snack or a larger meal. I understand the complex is only about four years old and is in pristine condition. The balcony has views over the park which was great to sit and chill on. We used the pool every day and it was never busy with only four to six people and we always had a sun lounger . There is a small cafe twenty yards away if you don't want to cook breakfast or lunch. The supermarket is fifty yards round the corner. There are several cafes within the locale. We went through the park and down the hill to the promenade at the beach which is lined with many restaurants and bars. This is a lovely apartment and well located for all amenities. Nous avons séjourné dans l’appartement pendant 15 jours durant le mois de juillet. L’appartement était très propre et beaucoup de matériel était disponible (accessoires de cuisine, chaises de plage, armoires pour ranger les vêtements, kit pour la salle de bain,...). Pour nous, il manquait juste un parasol pour la plage. Barbara est une très chouette loueuse, répond rapidement et toujours disponible si nous avons une question. L’appartement est situé juste à côté du tram ce qui permet de visiter les grandes villes (Alicante, Benidorm). Une voiture est nécessaire si vous souhaitez vous rendre dans des endroits plus à l’intérieure des terres. Je recommanderai volontiers cette location à des proches! No car is needed because everything you need is within a walking distance. Mercadona and Supercor supermarkets are a one minute walk from the flat. El Campello is in excellent location in a heart of Costa Blanca. The best way to arrive from Airport (21 km) to the Apartment is by Taxi, but you can do it by comfortable Tram or Bus too. The tram station “El Campello”is on the back of the building (10 m from the apartment). * Bedlinens and towels are included. * We suggest you bring beach towels with you.The apartment is not equipped with towels for the beach. * Costs (electricity, water, wi-fi, air-conditioning, air-ventilation etc. ): included. * Garage (in needed, on request) 10 Euro/per day. * Baby cot (if needed, on request) 10 Euro/ for total stay. * There in no daily housekeeping service. * Collect keys: on-site the day of arrival. Owner: spoken/written English, written Spanish.